Dental implants are a welcome addition to the restorative options available to patients with missing teeth. Unlike treatments popularized for the past few decades, dental implants are independent replacements for missing teeth that don’t alter surrounding oral structures, and actually boost your oral health. At Primo Smiles, we’re proud to be your source for dental implant treatment in Cynthiana, KY. Dr. Kerns and his team develop patient-focused treatment plans and are able to place and restore dental implants for the benefit of improved health and wellness. A dental implant is sturdy and versatile. Unlike a denture, full or partial, implants do not require daily application with adhesives and are capable of withstanding greater biting and chewing force. When compared to a dental bridge, another traditional way to replace a missing tooth, getting an implant does not mean that any neighboring teeth are altered. 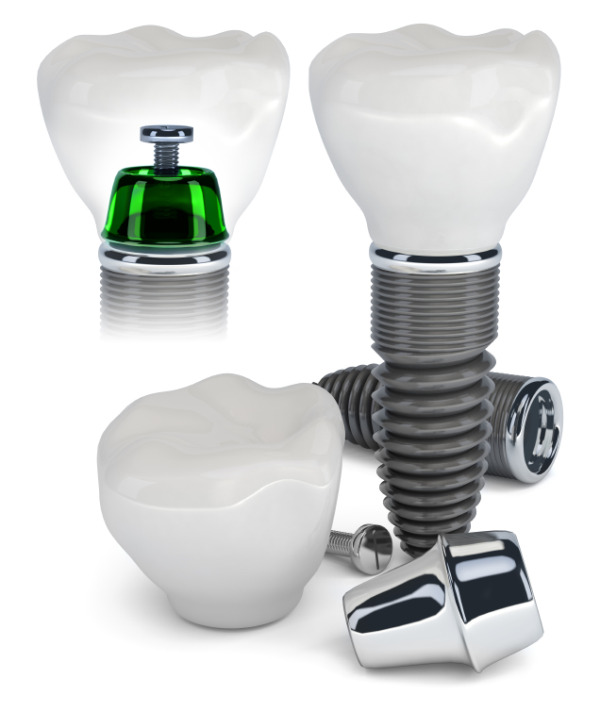 With dental implants, you also get options for replacing several or all of your natural teeth. Our Cynthiana dental office provides single implants, and well as implant-supported bridges and dentures for patients who are missing greater numbers of their permanent teeth. Your implant treatment begins when you visit our office for your consultation. Dr. Kerns evaluates your oral health, notes the number of missing teeth, and helps you decide if implants are right for you. Generally speaking, patients who are good candidate for implants are those who have otherwise healthy gum tissue and bone quality to support the implant. Placement – Implants are placed via oral surgery, so they can naturally integrate with existing tissue and become just as strong as your real teeth. Our oral surgeon completes the implantation, whether that’s one implant for a single tooth replacement, or several to support a full plate of dentures. Healing Time – It’s important to give your implant a chance to heal and fully integrate, so that your final treatment is strong and supports oral health and function. This time frame is different for everyone and can take several weeks. Restoration – To finalize your treatment, you’ll return to our office to have your crown or denture attached to your dental implants. Our patients love how strong and healthy their smiles look after implant treatment. Considering function, longevity, and health, dental implants are an excellent investment. Ask us your dental implant questions! If you’re ready to learn more about replacing missing teeth with dental implants, contact our Cynthiana implant dentist, Dr. Christopher Kerns, today for your consultation.